The duel of starters was sort of as advertised through five innings, but a key error led to the game being blown wide open, and the Cubs evened the series against the Dodgers by a score of 9-4. Ross Stripling has basically been the Dodgers ace this year, and he didn’t look his best tonight. It’s telling then that he allowed just one run in five innings (a solo shot to Javier Baez in the 5th), dropping his ERA to 1.98. Stripling allowed seven hits and a walk but wiggled out of trouble when necessary and struck out four on the night. But it was the Dodgers who struck first in the 2nd inning, led by Max Muncy walking and then stealing (!) second. Cody Bellinger then stepped up and roped a single to center to score Muncy, and he advanced to second on the throw and to third after the throw got away at home. 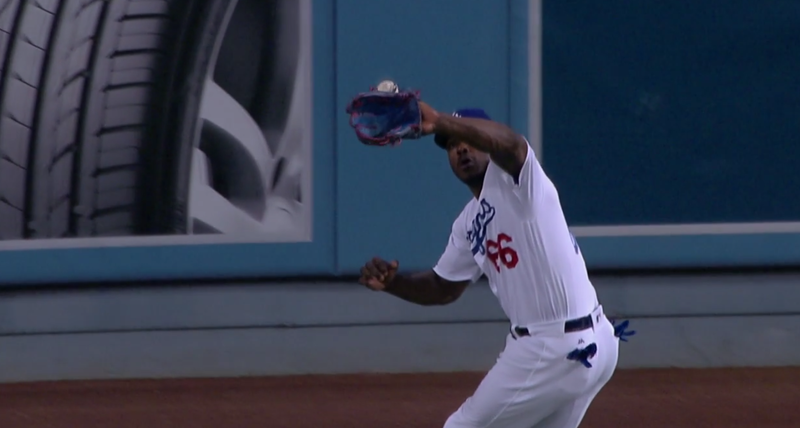 After that, however, Yasiel Puig‘s nightmare night got started when he grounded to third on a 3-0 count, which led to Bellinger getting cut down, and Puig was caught straying off the bag at first for a double play. Still, the offense took the lead in the 5th. Bellinger singled, with two outs he advanced to second on a wild pitch, and Austin Barnes followed with a bloop single to center to put the Dodgers up 2-1. Stripling was removed after five and 86 pitches, which led to a lot of complaining in retrospect, but the pitch count was consistent with what the Dodgers have always done since he became a starter. That wasn’t really the problem anyway. Yimi Garcia entered for the 6th and promptly allowed a single, but then induced a pop-out. Next he surrendered a line drive to Puig in right, who completely whiffed on it for a baffling error that put runners on second and third. An infield single then tied the game, 2-2, before Yimi’s outing ended with a seemingly huge strikeout (which should’ve been the third out with no damage accrued). Of course, that wasn’t the end of things, as Edward Paredes entered and allowed a single to left to give the Cubs a 3-2 lead. He then issued a walk to load the bases, and for whatever reason was allowed to face Baez, who absolutely obliterated the first pitch he saw for a grand slam and a 7-2 lead. But hey, at least he got a lefty to end the inning! Erik Goeddel then got a scoreless 7th, but Daniel Hudson gave up a run in both the 8th and the 9th, and Josh Fields had to be used to finish the 9th. The Dodgers scored two of their own in the 8th, but the error just generally took the wind out of the sales of the game and my willingness to write a detailed recap. The Dodgers fall to 42-36 on the season and 2.5 games back of the Diamondbacks in the NL West since they won today. Alex Wood will take the mound for the Dodgers tomorrow, and he’ll face off against Kyle Hendricks at 4:00 PM HST/7:00 PM PST/10:00 PM EST.